Continuing north along Sonoma Creek we arrived at the Watmaugh Road Bridge (20C0017). 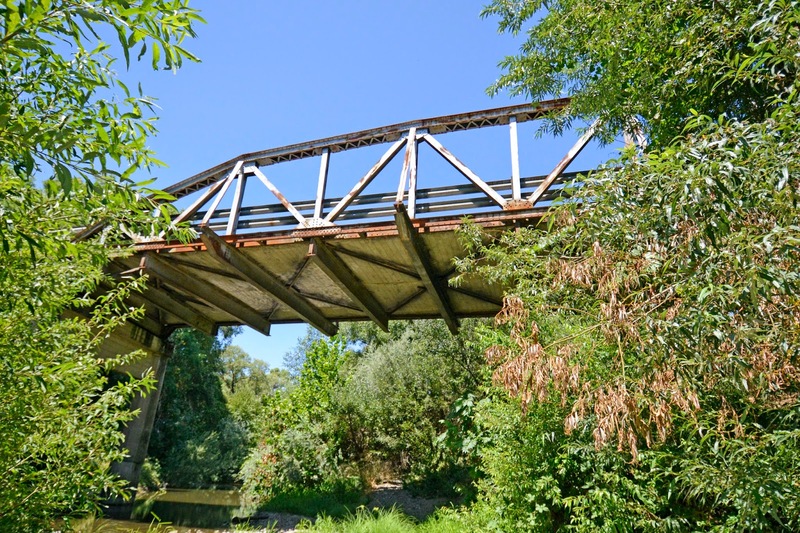 It's a three span bridge with a Parker through pony truss span over Sonoma Creek. Note the very large floor beams carrying the bridge deck. Every second floor beam is extra long to support a sloping transverse member that braces the truss. A plaque on a top chord mentions an award of merit that Sonoma League for Historic Preservation received in 1981 for their work to preserve this bridge. It has a sufficiency rating of only 4 out of 100 and I felt like I was risking my life standing on the narrow bridge deck because of the unending traffic. The bridge was built in 1929, so it's 85 years old and functionally obsolete. Sonoma County, California Bridges: Watmaugh Road Bridge across Sonoma Creek by Mark Yashinsky is licensed under a Creative Commons Attribution-NonCommercial-NoDerivatives 4.0 International License.